As the various home media releases of Phantom have differing levels of quality, this edit uses the Kino, Image, and BFI blu-rays for greatest picture quality. I used many of the same techniques found in my 1925 Version Reconstruction and some new ones. I desaturated the footage to black and white, as I was not satisfied with the tinting in any version. The Image and Kino blurays use the same underlying master. The Kino master is a much better encode with a better grain structure, but inadvertently crushes the black levels of some scenes while trying improve the look of the tinting. It also has various small editing and sync errors, mostly introduced while trying to fix splice marks. I created a composite by syncing the two together and overlaying the mid-tones and highlights from the Kino disk over the shadow detail from the Image disk. This helped me preserve shadow detail while correcting sync errors. The resulting picture is somewhat softer than the Kino disk, while still looking much better than the Image disk. This affords a good look to the film with less problems than the Kino or Image presentations on their own and in my mind is the best option outside of evaluating the picture on a shot-to-shot basis. The opening of the film through Carlotta speaking to the owners is taken from the BFI bluray, as it digitally removes the troublesome hair that wiggles all around the gate. Because the BFI bluray runs at 24fps and uses frame duplication to sync to it’s soundtrack, I had to use a decimate filter and then carefully match the footage frame by frame to the Image/Kino source to ensure there were no frames missing. Some shots in the cellars were taken from the newly discovered sound reel of Phantom on the BFI disc. It lacked the damage in the other 35mm copy. Bal masque sequence: The BFI bluray has poor coloration. The Kino Bluray and 24fps Image bluray has frame blending from an incorrect frame rate conversion. I took the interlaced 20fps Image bluray and deinterlaced it, eliminating as many blended field frames as possible. Rooftop scene: This is the only scene which I kept tinted to preserve the recreation of the two tone Handschiegl technique on the Phantom’s cape. The shots of Christine and Raoul come from the BFI bluray (better detail), with color correction to fix the rather poor tinting. The shots of the Phantom come from the Kino disc (better detail than the BFI, which uses a copy taken from an earlier Channel 4 restoration). Finale: The Kino Bluray and 24fps Image bluray again have frame blending from an incorrect frame rate conversion. The BFI bluray is tinted so strongly here as to be indiscernible. Even color correction shows that there is no detail to regain. I took the interlaced 20fps Image blu-ray and deinterlaced it, eliminating as many blended field frames as possible. This results in a rather soft look with lots of dirt (the interlaced mater had no computer restoration done on it), but it’s the best the sequence has ever looked on home media. Most of these recordings were not performed originally to the print they were synced to (the exception being the Laze soundtrack) and thus have sync errors even in their initial release. I have attempted to fix some of these by ear, but the sync is somewhat loose in general. Also of note is that while most of these scores run at 23.97 fps (NSTC Color speed), the Kino/Image blurays run at true 24fps for some reason, and I didn’t notice the discrepancy till I was well into syncing the video. This is addressed by simply duplicating frames in some of the intertitles, and should be unnoticeable, but the resulting file does have more frames than other releases of the film and is probably unsuited to be synced to scores running at other speeds. This track uses the Kino and Image releases to reconstruct the full score in stereo, although sections from the mono laserdisc are used at times. The first Image bluray uses frame stepping to slow the speed of its ballet sequences and runs in sync with the new Alloy Orchestra score. The Gaylord Carter score simply runs wildly out of sync for the first half of the film until they cut it around the middle (it’s still out of sync for most of it). The Image re-release attempts to fix the sync by cutting it up to fit the picture, although the results are still not great. The Kino release uses the sync from the first Image disk in error. This is a digital capture of the Gaylord Carter Score as heard on the laserdisc (from a mono tape source). There are some sections where the score audibly runs about a second before or ahead of the action on the laserdisc and I have attempted to fix the sync on some of those. Occasional hard edits and tape warble are present on the original track. Compared to the other tracks, this required more edits. The Killiam print used step-printing to reduce the frame-rate of the ballet scenes and the finale. For those cases, I edited down the soundtrack to the best of my ability to fit with the faster footage used here. The finale already featured many abrupt edits, so by shortening it, I was able to reduce their obviousness or eliminate them. The print also used the black and white version of the Bal masque sequence, so the soundtrack had to be edited to match the color one. This is a digital capture of the original laserdisc audio (from a tape source). It mostly synced well and required only a few edits. While most of the laserdisc runs at 24 fps, one reel in the middle of the film runs at 20 frames a second; a strange decision made by the projectionist. I could have matched this in my video edit, but in the interest of not having many separate HD video files, I have simply sped up the score for this section of the film by 20%. The audio fidelity suffers somewhat, and the tempo feels a bit off, but it’s a decent compromise that only effects a portion of the film. This score is sourced from the reelclassic dvd release, which is a capture of 16mm Essex films print. Being a worn 16mm print, the audio is scratchy, warblely and much lower fidelity than the other tracks. It also required more edits to match to the picture, although working with a noisier track means they were somewhat easier to disguise. This score is sourced from the full video version released on vimeo. The score was synced to a video running at 25fps (PAL speed), which I slowed down to 24fps using sox for re-sampling (also preserving the original pitch). There are a few edits for sync. On two occasions I was able to use the album release of the score to get a clean beginning and ending to a track, making the edit much cleaner. Gaylord Carter Organ Score: This score (recorded for Blackhawk Films) was featured in mono on an Image laserdisc and then remastered in stereo for the Image and Kino blurays. Unfortunately it’s wildly out of sync on both blurays, leaving the laserdisc as the only good presentation. I have included a re-synced stereo score as well as the original mono release. It’s a nice organ track by a prolific silent accompanist. Alternative Gaylord Carter Organ Score: This is a different recording, also by Gaylord Carter, performed for the Paul Killiam Film Classic Edition that aired on television in the 1980s (this copy of the score is sourced from a youtube copy of a television airing). It’s lower fidelity than the other Gaylord Carter score, but is a nice performance, with many different creative decisions that set it apart from the Blackhawk Films version. Korla Pandit Organ Score: This is a live recording of a Korla Pandit score, only ever released on laserdisc by Lumivision. Korla Pandit was an an African-American organist who publicly wore a bejeweled turban and adopted the persona of a French-Indian musician from New Delhi. He originated the television act later helmed by Liberace. The score is performed on a vintage Wurlizer theater organ and is lively and engaging. Somewhat strangely, the sound engineers for the 1990 laserdisc choose to dub in sound effects over the recording, mostly assembling a limited audience reaction track and some select sound effects. The audience reactions are clearly stock effects and, in my opinion, somewhat mar this otherwise fine track. Lee Erwin Organ Score: This is a score performed by Lee Erwin for the Essex Films/Griggs-Moviedrome release. It contains narration for the ‘man with the lantern’ opening voiced by John Griggs, a Broadway and radio actor who collected and sold vintage films. It’s sourced from the reelclassic dvd release, which is a capture of a 16mm print and thus is fairly low fidelity. Still, it’s a solid score for the film, performed by another prolific silent accompanist, now synced to a high quality picture. This release replicates the version of the score available for free on their Vimeo page. You can purchase the album version of the soundtrack on the Laze’s Bandcamp. The intro from the Blackhawk Films version of the film, which has an extended audio introduction over several title cards which introduce the picture. This introduction shows Korla warming up on the organ before his live performance. An excerpt from yet another recording of Gaylord Carter’s score to Phantom on a Møller organ originally commissioned for Reginald Foort which was then installed in a Pizza parlor in San Diego. From the album, ‘The Mighty Wurlitzer - Music For Movie-Palace Organs’ (1977). Now available on myspleen or pm me (click my user name and then select “create a private topic”) for a link. It’s got a whole new grade. Deakins supervised it and it looks good (and I think suites the photography better), but it has less of an aggressive sepia tone on the landscape, which is what O Brother was known for, being one of the first films graded entirely with a DI. It’s definitively worth preserving the DVD’s colors. Hmmm, try in Firefox. I get a new html5 player unlike the flash one they’ve used for years. For #1, the web interface scales with the size of the browser window. If you you make it really tall, the interface is outside the video, like so. You’d need to capture from a pc, and make sure that you still get the video’s full resolution (you should be able to with a 1080p monitor). These bits unfortunately would be scaled (it looks like earlier in this thread you figured out how to get the streams at native 480, which is real cool). Hi, this edit aims to be an HD recreation of the directors cut. If you can only watch standard definition DVDs, then I would just recommend watching the commercially available Director’s edition DVD. If you have already PM’d me in the past, your links should update. This sounds very cool. I wish you luck in finding the Cantonese dub of this cut. For this release of this project I have compiled four foreign dubs (Italian, French, Russian and German) and a host of subtitles from two different European dvd releases. Mr. Plinkett's Prequel Reviews Remastered in HD? I took a look at this today. This is really great work, thanks for your impressive effort on these. There’s just ton of stuff to recreate, I can’t believe you’ve done it all in avisynth. Thanks to Runner76 for finding a pretty large error in the purist edition (I had never actually proofed through all of it). I have made a v2 that fixes this error in addition to making more of the footage HD by compositing DVD footage over the HDTV footage. Anyone who has ever Pm’ed me on OT.com should have updated links in their inbox. If there are still errors, let me know. I now watched the Purist cut and love it. But i found a scene where the Audio (Both 5.1 and 2.0 ) are async for one scene. When Kirk is beamed to the Space Station from wich he is transported via shuttle to the Enterprise in spacedock, just after Kirk left the Transporter beam and askes Scotty why the transporters of the ship arent working, it starts to async. Oh my god, that’s a huge error. I never actually proofed the purist ed, as I assumed the only areas I had to look at were the changes. Congrats on being the first person to watch it and report back I guess. I’ll have an updated version up soon. Another problem i had, were the chapters. On my PC they are shown in my player and correctly Named. However on my real BD Player i cant skip chapters at all !? That’s probably just the BD player not recognizing a newer MKV function. You could try updating the player’s firmware or remuxing the file in an old version of MKVToolNix. Not much I can do. OK…question…if it has the added shots that he described, why is the time exactly the same? (I know that one of them is a replacement as opposed to an addition) Just curious. Both versions are in sync with the DC dvd (the editing is matched frame-by-frame). The added effects shots are in both versions. Replacement effects shots are sometimes only in the purist edition and the other version uses the HD theatrical version of the shot. The audio would be great in the original dolby digital format. I would use MakeMKV to rip the dvd to a mkv (be sure to select all the audio tracks). You can then use MKVToolNix to deselect the video track in that MKV file and make a new .mka file with just the audio tracks. If it’s too much a pain to do don’t worry about it. Yeah, I made a ‘purist’ version which has all the shots you want. It’s among the links I sent you. It’s synced with the DC, so any subtitles should sync after a 25fps to 23.98fps conversion. Audio should sync similarly. If you could pm me copies of the German language content I could add it to later versions. Sky_, I sent you a PM. Click the speech bubble in the upper right corner of the website to see your PMs. Yeah, that’s intentional, (and why I call this a fanedit in the readme). I was more interested in the editing in the DC than the new effects, particularly when there were shots that already looked good in the theatrical version. That being said, I just rendered out a “Purist Edition” that has most all of the changes (though they are limited to SD). People can PM me for a link if they are interested. The soundtrack (which represents a big part of this project) is copyrighted. I eventually will post a constant speed 20fps public domain version if anyone wants to play around with the edit or sync their own soundtrack. The bulk of the film is taken from the Kino Bluray (24fps version). I desaturated the footage to black and white, as I was not satisfied with the tinting in any version. The opening of the film through Carlotta speaking to the owners is taken from the BFI bluray, as it digitally removes the troublesome hair that wiggles all around the gate. Because the BFI bluray runs at 24fps and uses frame duplication to sync to it’s soundtrack, I had to use a decimate filter and then carefully match the footage frame by frame to the kino source to ensure there were no frames missing. Some scenes were taken from the older Image bluray (using the same underlying master as Kino), because the Kino master inadvertently crushed the black levels of some scenes while trying improve the look of the tinting. Opening Titles: While the complete original titles are lost (the 16mm print splices in a copy of the 1929 titles), sections survive in the trailers, and I used these snippets to reconstruct a section of the titles. 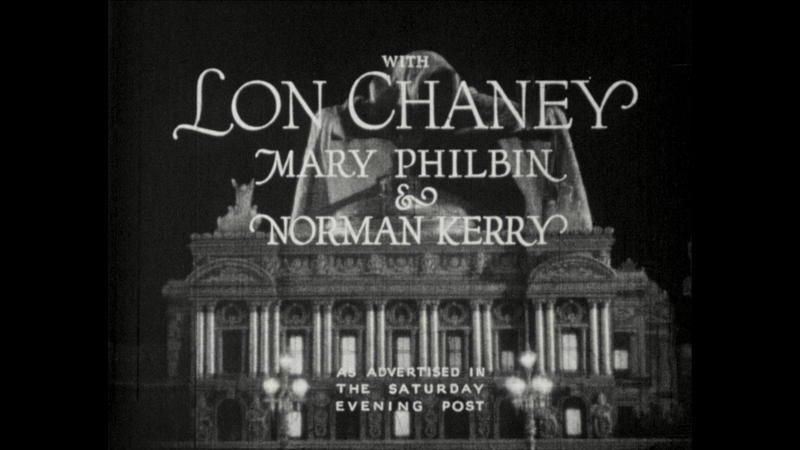 The director’s credit comes from the 1929 version. Bal masque sequence: The BFI bluray uses a copy taken from the earlier Channel 4 restoration, with poor detail and colors. The Kino Bluray and 24fps Image bluray has frame blending from an incorrect frame rate conversion. I took the interlaced 20fps Image bluray and deinterlaced it, eliminating as many blended field frames as possible. The missing title card was taken from the BFI disk (which recreates it), and color corrected. Rooftop scene: This is the only scene which I kept tinted to preserve the two tone Handschiegl technique on the Phantom’s cape. The shots of Christine and Raoul come from the BFI bluray (better detail), with color correction to fix the rather poor tinting. The shots of the Phantom come from the Kino disc (better detail than the BFI, which again uses footage from the earlier restoration). Finale: The Kino Bluray and 24fps Image bluray again have frame blending from an incorrect frame rate conversion. The BFI bluray is tinted so strongly here as to be indiscernible. Even color correction shows that there is no detail to regain. I took the interlaced 20fps Image bluray and deinterlaced it, eliminating as many blended field frames as possible. This results in a rather soft look with lots of dirt (the interlaced master had no computer restoration done on it), but it’s the best the sequence has ever looked on home media. 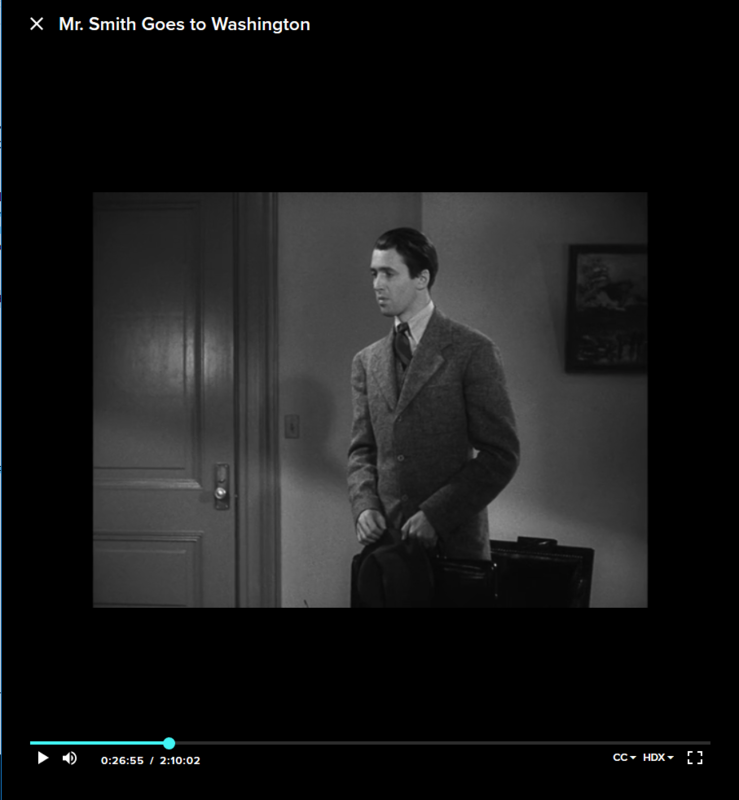 General edit: It’s a fairly faithful reconstruction of the original continuity, just running at a varied framerate to accommodate the different lengths of shots in the 1929 version. There are some shots in the 16mm that I’ve rearranged for continuity reasons (they clearly were spliced in incorrectly in the 16mm dupe). There are some quick shots cut out for similar reasons. The 1929 footage is obviously different takes and angles from the 1925 footage, but for the most part you can match it up quite well. I kept one new title card from the 1929 version, as taking it out would have otherwise introduced a big jumpcut. Similarly, I made one new title card for the same reason in the first Carlotta scene. This is an attempt to reconstruct the 1925 edit of the film using the higher quality 35mm material. The scenes present in the 1929 version use 35mm footage, while all the material exclusive to the 1925 version comes from the 16mm print. I have used Ben Model’s excellent organ score for the 1925 version. (As heard on reelclassicdvd’s DVD). To sync this edit to a preexisting score, I adjusted the speed of the footage throughout the film, generally keeping it within 16-24 frames a second, with the majority of the footage presented at around 20fps. The final file is a 60fps 1080p MKV (not blu ray compatible) with the real framerate being variable. When further edits were required to keep the sound and picture in sync, I made (hopefully unobtrusive) edits to the soundtrack. The Technicolor sequence in the middle of the film uses Gaylord Carter’s organ score. Reelclassicdvd’s DVD used the BFI/Channel 4 version of the Technicolor bal masque sequence, which runs at a very slow speed (around 13 fps). This is a more natural level of motion, as the Technicolor camera had to be cranked very slow to get enough light, but it is not very period-accurate, looks bad and slows the pace of the scene. I have this sequence running at around 20fps, using a slowed down version of Gaylord Carter’s organ score taken from the Kino/Image bluray. 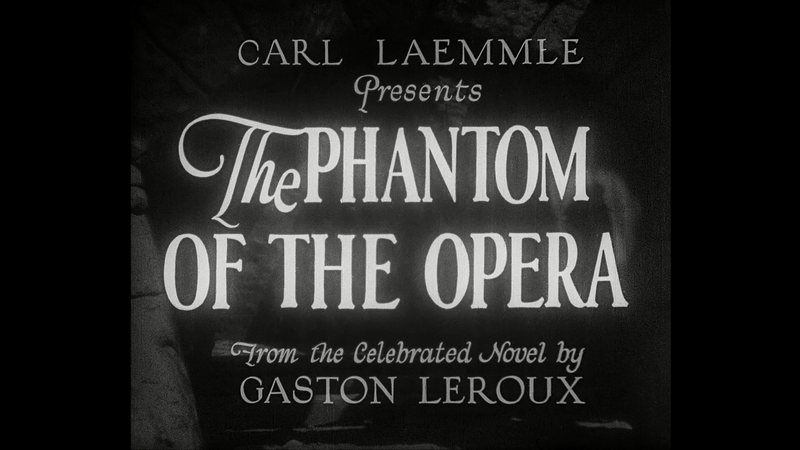 As the various home media releases of Phantom have differing levels of quality, this edit uses the Kino, Image, and BFI blu-rays for the 1929 footage, with the 16mm footage coming from the HD transfer on the BFI bluray (including the title cards). Pm me for a copy. Also on Myspleen. I am so sorry about your cat. Okay, I rendered out a purist version that includes most all of the DC changes. I have included most all of the shots altered for the director’s cut DVD, from major shots like the V’ger sequence all the way down to re-colored viewing screens. It’s easier to list the shots that weren’t included here (these are more minor omissions than it might look like at first glance). Right now the project files are on a different computer while I’m away at school, but when I get the chance I can probably render something. Some people have already requested one, but I forgot to do anything about it. There are actually a lot more shots that have been modified then people realize, so it still would involve a degree of picking and choosing. Most people are interested in the finale shots of V’ger making the bridge. The biggest issue is that a couple of the shots run at 30 fps interlaced, so I’d have to find a way to interpolate the framerate satisfactorily. In short, I can totally do it, it just might not be for a while. I have a very small update to this that I’m putting out. I rendered V3 out awhile back to correct some small errors, particularly a jump cut that I accidentally introduced. I was waiting and see if there were any bigger changes I wanted to make to justify a new release, but since there aren’t, I might as well release this now. added Grace Lee Whitney (as Janice Rand) to the list of co-stars in the opening credits. She was treated terribly during her time on the show, and I think her name deserves to be next to the rest of the original cast (some promotional materials featured her similarly). The audio is now the untouched dolby digital track from the DVD (not rencoded) until the end credits, when it seamlessly cuts to the new end credits music. This saves some space and preserves Blu-ray compatibility if you want to remux. Anyone who PM’d me previously should have the updated version in their inbox, as I have updated the links. I sent you a pm back when you first asked. I have sent you another. Just click the speech bubble in the upper right corner of the website to see your PMs. This might be useless info but I found this very good quality pic of the original senate scene, I couldn’t find where it originally came from but I’m hoping that there’s a clip of it in this quality. It’s from starwars.com and there’s no corresponding video.